New for 2018 US Optic’s SVS 1-6x24 Riflescope is a CQB riflescope with an illuminated MIL Scale Reticle. The 2 MOA red dot has 10 levels of illumination including 3 low levels that are night vision compatible and has a battery life of up to 500 hours. 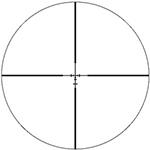 The riflescope utilizes a rugged 34mm aluminum tube and has capped adjustment turrets with 2/10 Mil adjustments.